Oxford is one of the oldest and most celebrated university towns in Europe, and for centuries has rivaled Cambridge for academic pre-eminence in England. Its untrammeled spirit of exploration; numerous delightful gardens, courtyards, and university parks; together with the hectic bustle of its pedestrian zone and excellent cultural facilities all help create a very special atmosphere. Oxford has plenty of tourist attractions, including Carfax Tower, offering superb views over the city, and the historic Covered Market with its excellent shopping. For a truly unique vacation experience, some university colleges now offer accommodation options, including bed and breakfast. Harry Potter fans may be interested to learn that various Oxford landmarks appeared in the movies, including Christ Church College, where the dining room was closely copied for the Hogwarts Great Hall. And for something a little quirkier, check out the (in)famous Headington Shark, a shark sculpture stuck headfirst in the roof of a humble terraced house. 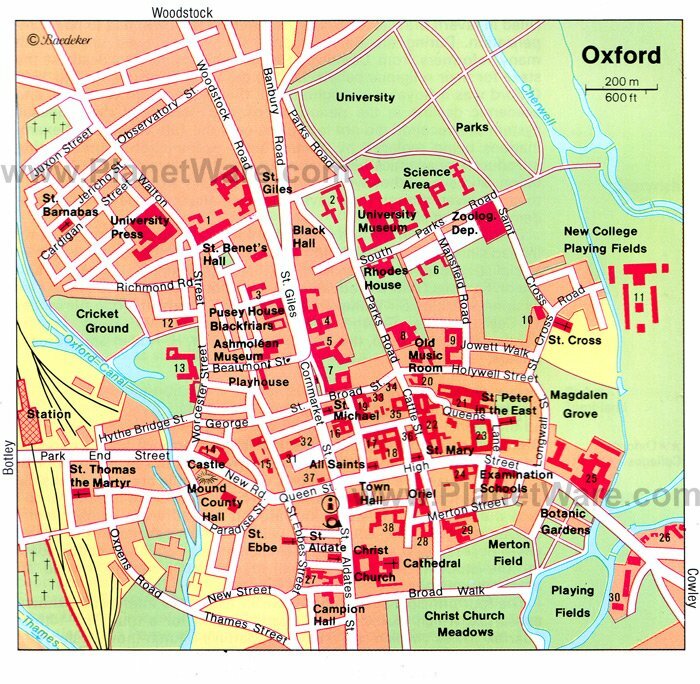 Although the center of Oxford is not large, plenty of time should be allowed for a visit since there are so many things to do here. The city's four principal streets meet at the intersection known as Carfax, a good starting point for a tour. The 14th-century Carfax Tower, a relic of St. Martin's Church (now destroyed), has great views. Also worth visiting are the Town Hall; St. Aldate's Church (1318); and Pembroke College, founded in 1624 but with origins dating back to 1446. The nearby Modern Art Oxford, a visual art gallery focusing on exhibitions of modern and contemporary art, regularly offers talks, music, and movies. Oxford's splendid High Street is lined with numerous magnificent buildings (including many of the colleges) and was described by American writer Nathaniel Hawthorne as "the finest street in England." While sightseeing, visit the University Church, St. Mary the Virgin, with its fine decorated tower (1280) offering excellent views of the city. Also of interest are the choir, rebuilt in 1462; the nave and Lady Chapel, dating from 1490; and the stalls, dating from 1466. Although the present building dates from the 12th century, Christ Church acquired cathedral status in 1546. The most striking feature in the interior is the double arcading of the nave, creating an impression of much greater height. In the 14th century, the church was extended to the north, and the choir was created in 1500 with fan vaulting overhanging keystones. In the south transept is the Thomas Becket window (1320) and five glass windows designed by Edward Burne-Jones and made by William Morris in 1871. Also of note are the St. Frideswide window (1858) and three 14th-century tombs of Lady Montacute, Prior Sutton, and John de Nowers, as well as the remains of the Frideswide's shrine (1289). The grave of philosopher George Berkeley (1681-1735), who gave his name to the town of Berkeley in California, is also located at the cathedral. Christ Church, one of the largest of Oxford's colleges, was founded in 1525 by Cardinal Wolsey and re-founded after his fall by Henry VIII. Tom Tower, added by Christopher Wren in 1682, contains a huge seven-ton bell known as Great Tom, which peals 101 times every evening at 9:05pm (once for each member of the original college). The main quadrangle, with its charming fountain is known as Tom Quad and is the largest courtyard in Oxford. The lower tower, with its fine staircase and fan vaulting, leads up to the hall, an elegant dining room with a magnificent wooden ceiling completed in 1529. Portraits of Henry VIII and distinguished members of the college - including William Penn, founder of Pennsylvania - adorn the walls. Beyond the Deanery (Charles I lived here from 1642 to 1646) is Kill-Canon, a passage so chilly that it was feared canons would catch their death of cold. Kill-Canon leads to Peckwater Quad, with its library containing drawings and mementos of Cardinal Wolsey. Art lovers will also want to visit Christ Church Picture Gallery, home to an important collection of 300 Old Masters and 2,000 drawings. Beyond the college stretches a deer park called the Grove and a bridge leading over the River Cherwell into the Water Walks. Opposite the entrance to the college is the Oxford University Botanic Garden, founded in 1621 and one of the oldest in England. Plants from all over the world can be found here, including the Magdalen Rose Garden, a gift from the Albert and Mary Lasker Foundation of New York to commemorate the development of penicillin in which Oxford played a considerable part (also worth a visit is the satellite Harcourt Arboretum). Radcliffe Square is home to the Old Schools Quadrangle (1613) and the Radcliffe Camera (1737), a rotunda that originally housed the Radcliffe Library. The 16-sided room on the ground floor is now a reading room for the Bodleian Library, the university library and the country's first public library, founded in 1598. A copy of every book published in Britain is deposited here, including some two million volumes and 40,000 manuscripts. From the library, you can also explore the magnificent Divinity School. Built in 1664, the Sheldonian Theatre was Sir Christopher Wren's second major building and is used for the university's annual Commemoration. The Museum of the History of Science - housed in the Old Ashmolean Building, the world's first purpose-built museum building - is a fascinating facility that specializes in the study of the history of science and the development of western culture and collecting. The museum includes the blackboard that Albert Einstein used during his Oxford lectures of 1931. Other nearby attractions include the Holywell Music Room (1748), reputedly the oldest concert hall in the world, and Kettell Hall (1620) with its beautiful chapel and fine woodcarvings. A cross in St. Giles Street marks the spot where the reformers Latimer, Ridley, and Cranmer were burned at the stake between 1555-56, an event commemorated by the Martyrs' Memorial (1841). The nearby Rhodes House (headquarters of the Rhodes Trust founded in honor of South African statesman Cecil Rhodes) is also worth checking out. Also close by is the Oxford University Museum of Natural History, built in 1855 and containing a number of interesting collections, including geological, mineralogical, and zoological sections, as well as work by Darwin, Burchell, and Hope. There's also a pleasant walk along the Cherwell past Parson's Pleasure to a path called Mesopotamia, which leads to Magdalen Bridge. The Ashmolean Museum, founded in 1683 and the oldest in the country, is the most important of the four university museums. The Neoclassical building houses a magnificent collection of art and antiquities, including classical sculpture, Far Eastern art, Greek and Roman pottery, and a valuable collection of jewelry. Other Oxford museums that should be added to travel itineraries include the Pitt Rivers Museum, with its fascinating anthropological and archaeological collection, along with the Museum of Oxford, a local history museum that deals with both the city and the university's rich pasts. For something a little different, the fun Story Museum is popular for its literary-themed events, including the popular Alice Days celebrating the first ever telling of Oxford-educated Lewis Carroll's Alice's Adventures in Wonderland. Pedestrian-friendly Cornmarket Street, commonly known as the "Corn," is Oxford's busiest shopping street. Along with its many big-brand shops and department stores, the street is also home to the historic Golden Cross arcade, popular for its craft and jewelry shops, and the Covered Market, dating from 1774 and housing an eclectic mix of food retailers. Also of interest is the former Crew Inn, where Shakespeare is said to have stayed on his journey between Stratford and London, and St. Michael's Church, notable for its early Norman tower. Oxford Castle has been a place of incarceration since 1071, continuing until the closure of Her Majesty's Prison Oxford in 1996. Today, visitors can learn about the real people and events from the site's turbulent past through fascinating displays and re-enactments. Other highlights include the chance to climb the Saxon St. George's Tower, Oxford's oldest building, and enjoy its stunning 360-degree views. Afterwards, descend deep underground into the 900-year-old crypt. Other areas to explore include the confines of the 18th-century Debtors' Tower and the 11th-century motte-and-bailey castle. Guided tours and numerous fun themed events are available. In Woodstock, just eight miles northwest of Oxford, is Blenheim Palace, seat of the dukes of Marlborough and the Spencer-Churchill family and birthplace of Winston Churchill. This magnificent 200-roomed palace was built between 1701 and 1724 for John Churchill, first Duke of Marlborough, with the financial support of Queen Anne, who wished to express her thanks to the Duke for his victory in 1704 over the French at the Battle of Blenheim, an event commemorated on the ceiling of the Great Hall. In addition to visiting the splendid main building with its Neoclassical columned entrance-hall and quadrantal annexes with crowned corner-towers and colonnades, be sure to explore the adjoining wings, with their large courtyards, as well as the vast main courtyard. Another highlight is the chance to explore the magnificent gardens, with their French Rococo borders, and the Capability Brown designed parklands. Other outdoor attractions include Italian gardens and herb gardens, a butterfly house, and a maze. An easy drive just six miles south of Oxford, Abingdon is a charming town on the banks of the River Thames. A large number of interesting houses and churches are found here, including the old two-story county hall, built in 1678 and now home to the Abingdon County Hall Museum. Also of note is the beautiful St. Helen's Church, with its graceful spire, double aisles, and elaborately painted paneling (1390), as well as Christ's Hospital, founded in 1553. Parts of the once influential Benedictine abbey (AD 675) can still be explored, including later features such as the Checker Hall (13th century), the Long Gallery (about 1500) and the abbey doorway (1450). Abingdon has several leisure and recreation facilities, including the White Horse Leisure and Tennis Centre, Tilley Park, and the Southern Town Park. Each year in October, the town center is closed for the Ock Street Michaelmas Fair, the longest street fair in Europe. Old Bank Hotel: luxury boutique hotel, Georgian building, central location, understated elegance, marble bathrooms. Vanbrugh House Hotel: mid-range pricing, individually decorated rooms, private gardens, complimentary breakfast and snacks. Remont Oxford Hotel: affordable rates, short bus ride to town, colorful room accents, free English breakfast. Premier Inn Oxford Hotel: budget hotel, drive to city center, modern decor, family rooms.